The Attack Democrat--Nothing Conservative Here: Has Trump run out of time? Not Yet. Not by a long shot. Has Trump run out of time? Not Yet. Not by a long shot. David Byler at Real Clear Politics has an interesting chart that suggests what we should look for in the Clinton/Trump polls over the next 30 days or so. Byler’s chart is based upon work by Christopher Wlezien and Robert Erikson, authors of The Timeline of Presidential Elections. 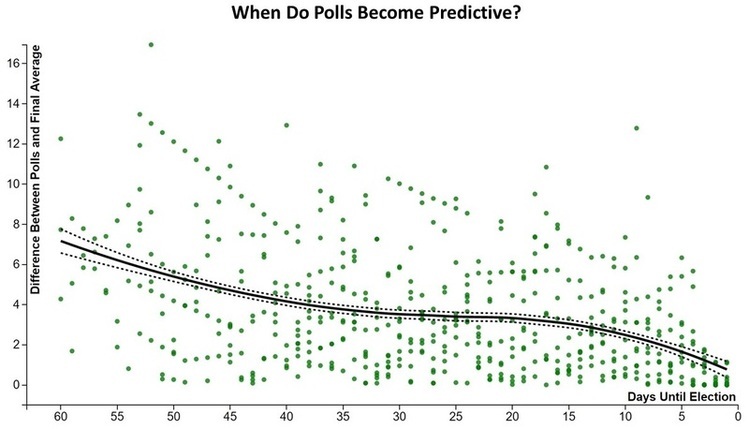 The chart shows how far the polls are off from the final polling average based upon the number of days to the election. Notice the solid line. As we get closer to the election, the polls get more accurate-closer to the final average. 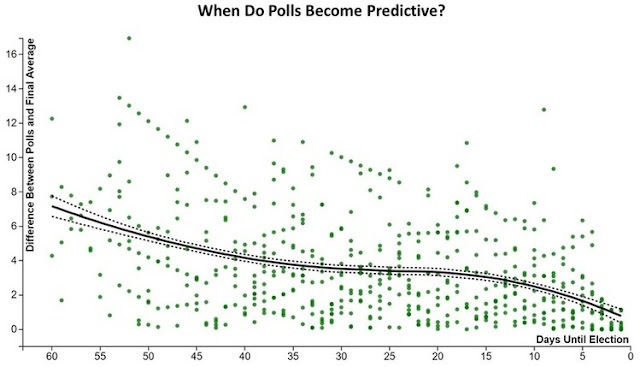 There are more dots (polls) below the trend line as we get closer to the election. Many polls will be as much as 7 to 8 points off 60 days out, but by 30 days out, most polls are within 3 to 4 points of the final result. What does this mean? Hilary is ahead 5 points now, according the RCP average. That means Trump has time to close the gap. But, he has to close it by the end of September. If Trump can close the gap to 3 points or less by October 1st, he has a chance of going ahead by election day. On the other hand, if Clinton is ahead by 4 points or more then Trump’s chance of catching up with her by election day is slim, at least based upon historical polling data. There just will not be enough time to move the polls in his favor. Watch the RCP Average, Clinton was up, on the average, by as much as 7 or 8 points in early August. It is close to 5 points as of today. She needs to keep this lead for the next month, at least. If her lead starts drifting down to 4 points or less, she could be in real trouble. If she keeps her lead above 4 points, then it is going to be really difficult for Trump to catch up and pull ahead. This election is a LONG WAY from being over. Trump could STILL WIN. Keep donating money and working for Hilary.